New York and London contemporary art galleries have been closing, moving or decimating. Auction results are sagging…Now what about Tokyo? Even this isolated art & design city has been feeling the crunch, slowly but surely. Galleries that participated in the Armory Art Fair in New York last March came back home with a shrug. 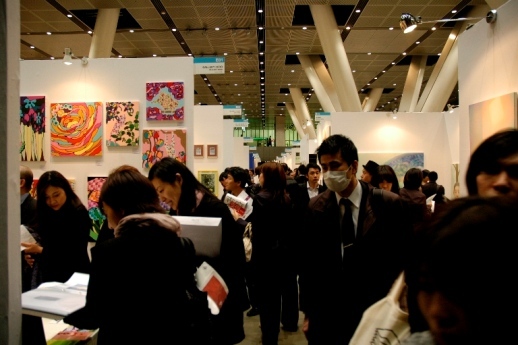 Art Fair Tokyo, which took place the following month, was great for galleries with young and still relatively affordable artists (Kodama Gallery re-did their installation once their first batch of works sold out) but galleries with works over 500,000 yen had a harder time convincing the crowd (45,000 visitors over 4 days, an increase from last year) that it was a good time to invest in the arts. Contemporary galleries this year mostly seemed to use AFT as an opportunity to show rather than sell. That was one reason why the installations in the booths looked pretty tight. At the same time 101Tokyo took place again and was attended by 5,000 people. But quite how that translated into real sales for the galleries is more difficult to say. No one wants to break face! Also, although it is meant to happen twice a year, Takashi Murakami’s GEISAI will not be held again until 2010 it seems. Nanzuka Underground moved from its former Shibuya basement location to be closer to other galleries in the new Shirokane complex. And Zenshi has pulled out of the Kiyosumi-Shirakawa building (although this move may not be solely for financial reasons). Tomio Koyama Gallery will be closing its Ryue Nishizawa-designed Daikanyama space in June (as reported on TABlog). But the struggle is particularly evident in other areas, especially in the media industry. Esquire Japan went on an “extended break” (although a petition has been launched to try to bring it back! ), along with many other magazines. Ping Mag closed over the New Year, followed by Tokyo Art Cross (as reported here on TABlog). ART iT will no longer be printing their glossy issues, but instead will offer their articles and reviews via their new website.